I have a passion for making other people smile. And what better way, than to put an ‘ukulele in their hands and watch as their eyes light up. Add that to the joy I have in creating experiences and adventures people won’t soon forget. . . . .and life is very good, indeed. My adventures with the ‘ukulele started about 9 years ago when my (then) eleven-year-old son, Taylor, and I attended Keola Beamer’s Aloha Music Camp on Moloka’i. During the student ho’ike (recital), held under a tent outdoors, a little gust of wind came along and blew our music from our laps and created one of the biggest train wrecks the island had ever seen, as we looked up at our audience in shock and attempted to finish The “Moloka’i Slide” by memory. It was not pretty. As a result of that little misadventure, Taylor and I determined that we needed a little clip that would secure our various “cheat sheets” to the headstock of our ‘ukuleles, something that was lightweight, unobtrusive, and secure. By the time the next Aloha Music Camp rolled around six months later, we had our little Kani Ka Pila Klips and found that quite a few of our fellow campers (ukulele players and slack key guitarists) wanted one, as well. And thus was born, Kani Ka Pila, a traveling ukulele store featuring fun and quirky–but mostly useful–accessories and ‘ukuleles you may not find anywhere else. (In Hawaiian, kani ka pila translates roughly to “let’s make music.”) Now we needed a place to try and sell them. At the time, ukulele festivals were far and few between. 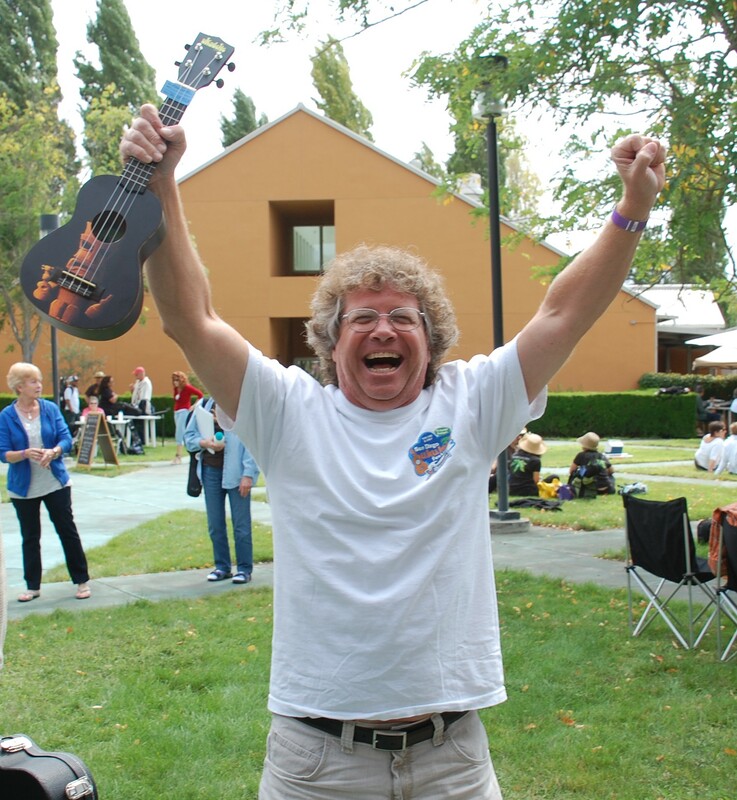 So, in 2008, we created the first Wine Country ‘Ukulele Festival in the beautiful Napa Valley and invited a virtual who’s who of the ‘ukulele world at that time: James Hill, Herb Ohta, Jr., Kimo Hussey, Keoki Kahumoku, Ralph Shaw, Mark Nelson, Robyn Kneubuhl, KonaBob, Faith Ako, Steven Espaniola, and Andy Andrews. It was a resounding success on all fronts and has remained an annual tradition ever since, bringing people together from all over the world to learn together, play together, and celebrate the ukulele a midst the burgeoning vines and lovely aromas of grapes turning into wine. And year after year, we get the nicest people to come and join us. But I still wanted the kind of experience I had shared in Moloka’i: a group of like-minded people focused on enhancing their skills in a safe, nurturing environment, away from the distractions of everyday life. Not a festival, but a retreat. I had enjoyed such experiences at a beautiful retreat center on the Central California Coast called Asilomar and wondered what it might be like to add ‘ukuleles to the mix. 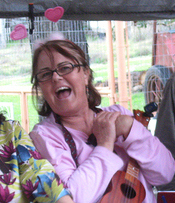 Nothing short of fantastic, I discovered, after our first West Coast Ukulele Retreat in the spring of 2011. That, too, remains an annual event, the same. . . . .but different. . . . . every year and just getting better and better. We call it “The most fun you can have with your ‘ukulele on'” and are happy to see so many of the same faces coming back, again and again. 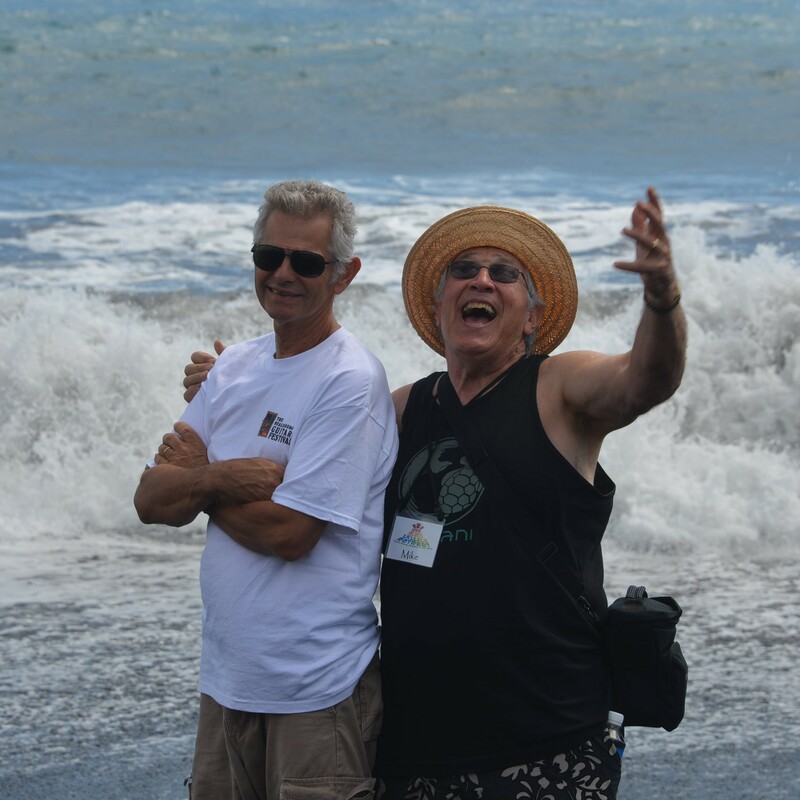 Hawai’i seemed like the next logical place to spread our ‘ukulele wings and so in 2013 we held our first Hawai’i Island Ukulele Retreat at Kalani Honua, nestled between the black sand beaches of Puna and Kilauea, the most active volcano in the world. What a dramatic and beautiful setting…but not without its challenges. And so this year, we will be heading to the opposite side of the island, where the trade winds blow and the little coqui still has not gained a foothold, and the charming Kohala Village Inn in Hawi. 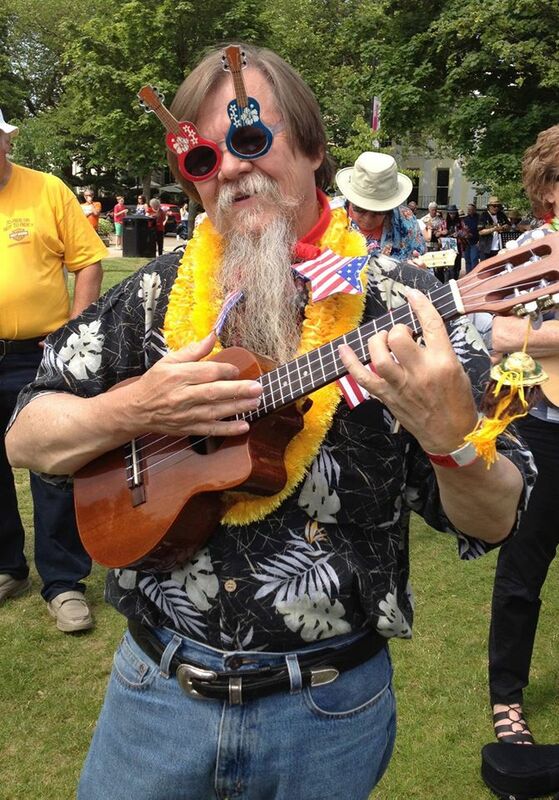 And then there was the 2013 Yankee Ukulele Invasion of Great Britain. What an amazing time we all had: three days cavorting with ukulele players across the pond at the Ukulele Festival of Great Britain and another 4 days exploring (and eating our way through) the beautiful Cotswolds region of England with our resident ukulele instructors, David Egan and Ukulollo. Alas, we finally had to retreat. But if I can build another army, we shall return. We want to return……..
Then, at the request of one of our foreign-based attendees, we created La Semana de Uke-Culinary Fiesta held in Ajijic, on the shores of Lake Chapala in Mexico with those whacky superstars of southwestern cuisine and ukulele mastery, Heidi Swedberg and Daniel Ward. Two more talented and caring (and fun-loving) teachers would be hard to find. And a big part of our week-long adventure in Mexico, is the ongoing support of La Academia de Ukulele de la Ribera, a very successful program for local children that we founded during our first visit. We can’t wait to go back and hope you will decide to join us. 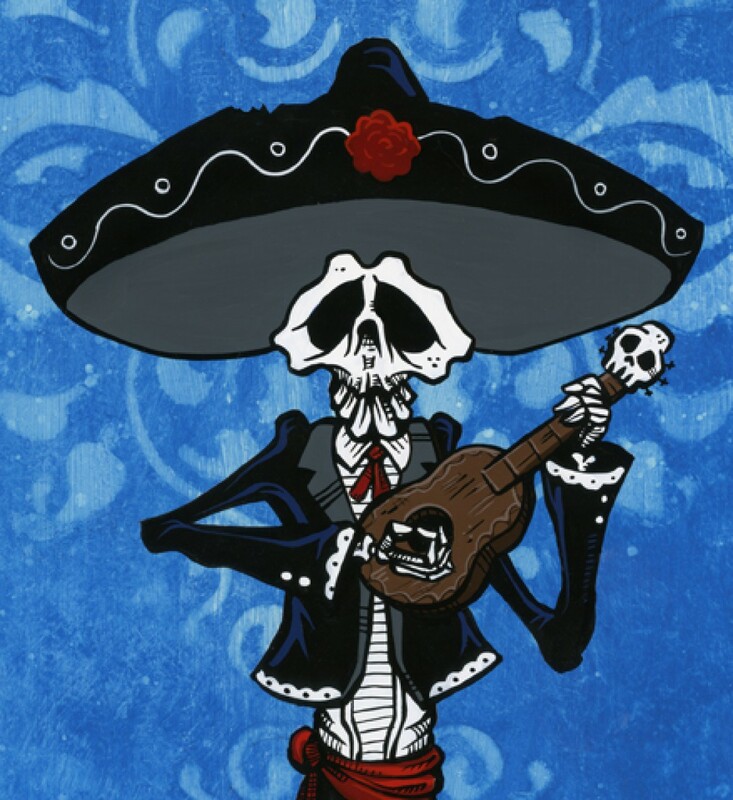 And we’ve got two new ones in store: The New Uke-Culinary Fiesta in Santa Fe, New Mexico and Uke-semite, an ukulele retreat in the shadow of Yosemite that includes song-writing and full recording studio? And we’ll also be checking out the Czech Republic and it’s new (and highly acclaimed) Ukulele Festival with a stay in Lucca, Italy for this summer, as well. So, if any of these sound interesting to you, please let us know so we can make sure that you and your ukulele don’t get left out in the cold.